Home > Services & Info > Fiamma Choosing Guides > Which Fiamma Awning for Renault Trafic, Vivaro & Primastar? Guide includes Renault Trafic, Vauxhall Vivaro and Nissan Primastar version from 2001 to 2014. The second generation Renault trafic (also sold as Opel / Vauxhall Vivaro and Nissan primastar) was made from 2001 to 2014. Available in long and short wheel base with standard and high roof versions. This guide explains the options available to fit a Fiamma Awning to these vans. For the standard roof version of the Trafic you can fit either a Fiamma F45 S or F35 Pro awning. Which model you fit is your choice. 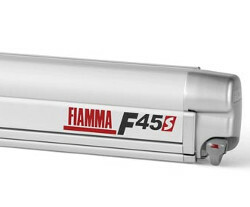 The Fiamma F35 Pro is a lightweight sun canopy which is manually unrolled from its case. The F45 S is a more substantial canopy which winds out from its case using a winding handle. Once you have chosen the model of awning you would like, the length of awning to fit depends whether your van is long or short wheel base. 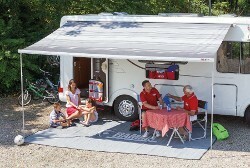 See the tables below for the sizes of awning it is possible to fit and the appropriate fitting kit to use. *All fitting kits on standard roof Trafic / Vivaro require drilling of the van roof. If your van isn't covered please get in touch with us and we'll do our best to advise you. You can call 0161-902-3025 during office hours or email sales@agentfiamma.co.uk anytime. Awning installation kit for the Fiamma F35 Pro awning. Suitable for Renault Trafic, Opel Vivaro and Nissan Primastar from 2001 to 2014.